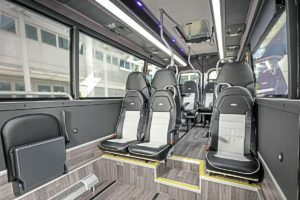 Bus and Coach Buyer has been to EVM to take a ride on the last of 35 lowfloor Sprinters to be delivered for the ArrivaClick service. 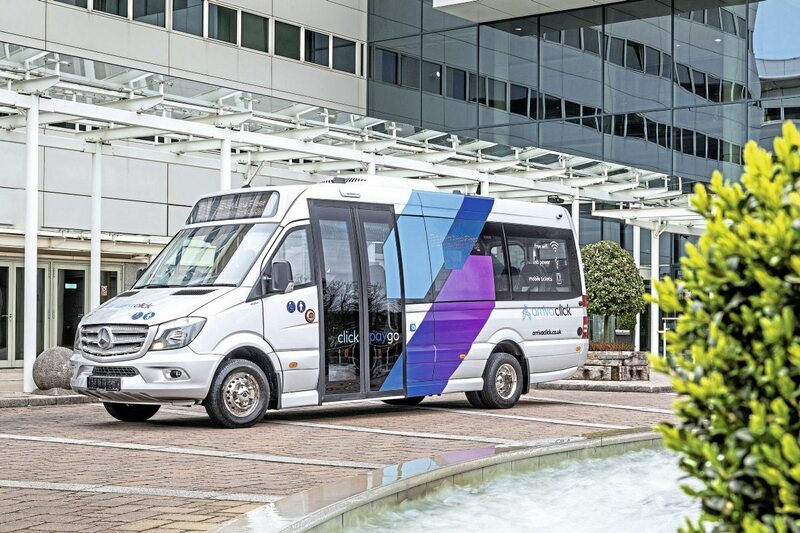 The last of EVM’s order for ArrivaClick demand-responsive vehicles has been delivered, and with it, the foundation of one of the most innovative developments in the modern history of the bus industry. I’m riding aboard that final ArrivaClick vehicle now, and pondering over much more than just the remarkable vehicle I’m aboard. And this Irish-built, semi-lowfloor Sprinter is remarkable, not least because the significant engineering it required was passed by Mercedes-Benz itself at a time when the German giant was making an almost identical modification itself at its Dortmund factory. As a rear-wheel drive base vehicle, the Sprinter presents converters with some big challenges if they want to create a lowfloor section. 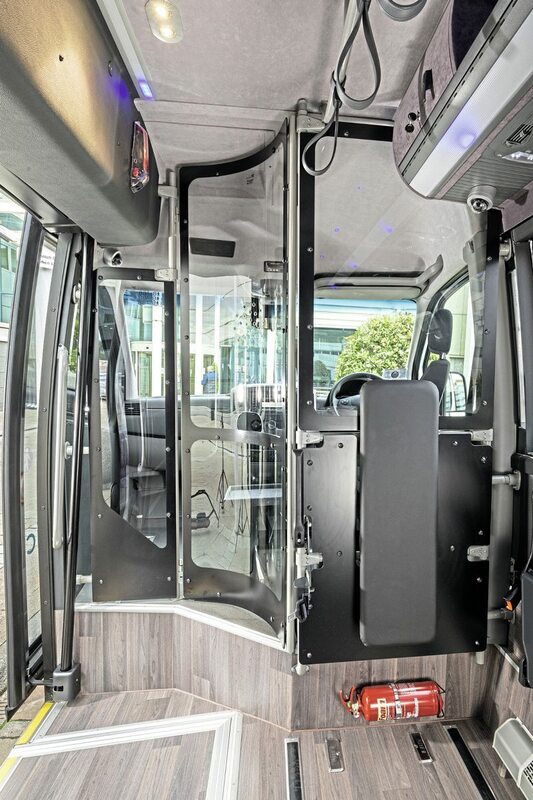 The attraction is a vehicle brilliantly engineered, capable of huge mileages and reliability, impressively low fuel consumption and a driveline which has proven to be incredibly robust. To achieve what it had in mind, EVM had to re-engineer the propshaft to run under the lowfloor section. It’s the same solution other converters have used, including Mercedes-Benz, but it speaks of the engineering excellence at EVM, and its determination to push the boundaries of the probable into the uncertainty of the possible. 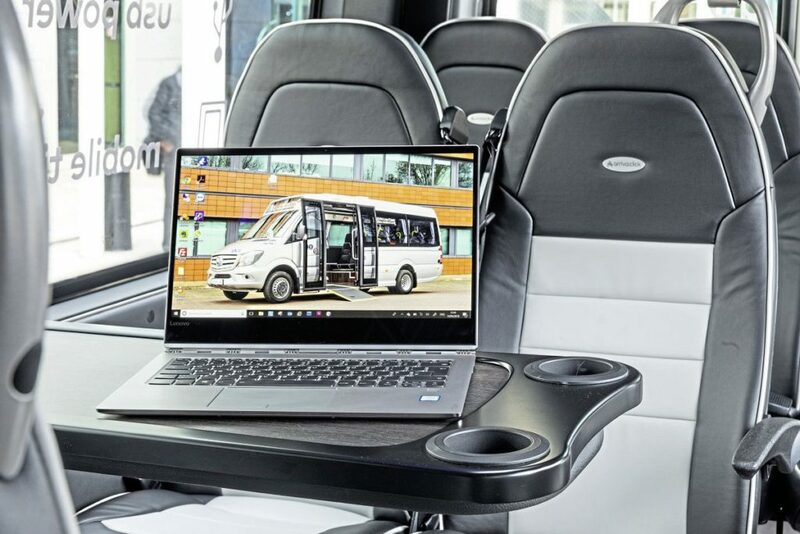 EVM’s Cityline lowfloor concept surfaced as the first built vehicle in 2014, the same year that Daimler launched its own version in the expectation that buyers would rather have the Mercedes-Benz-built version direct from the OEM. It didn’t really work out that way. 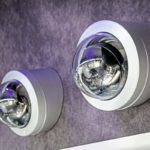 While M-B did sell a lot of City 45 models, EVM’s sales steadily grew and, along the way, it picked up some impressive orders including, latterly, the ArrivaClick business. The reason, I suspect, was the flexibility of EVM in being able to massage the model into precisely the shape the buyers wanted. The last of the ArrivaClick order shows this progression. 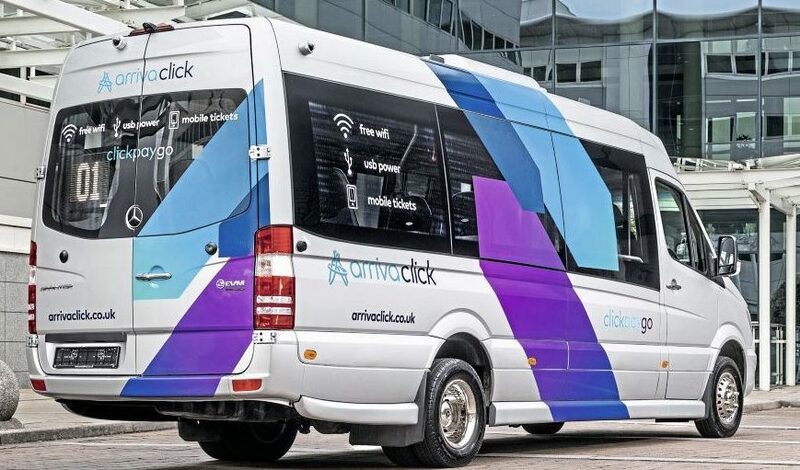 Arriva’s intention with Click is to persuade car drivers out of their cars and on to the demand-responsive service, and it clearly believes, as does EVM, that any decision to use the service regularly depends not only on the price and reliability, but also the travelling environment. This is apparent in the vehicle. 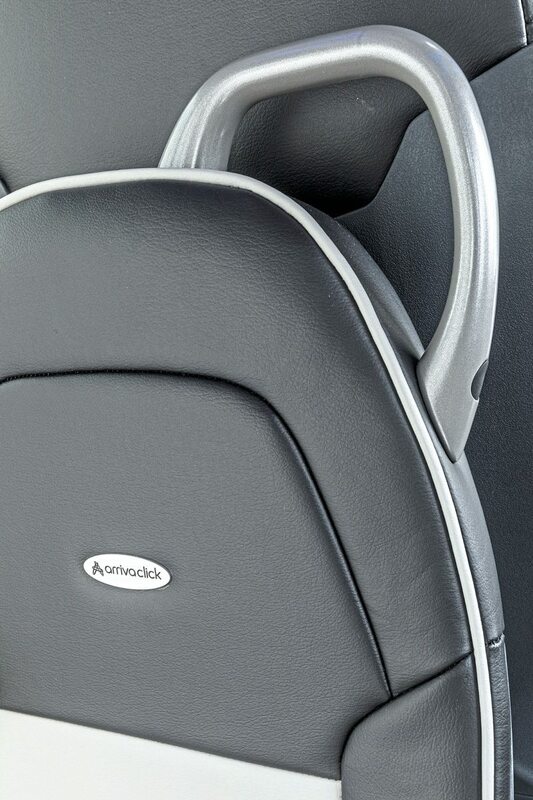 The seats are of executive car quality and style, every seat has USB sockets and wifi, and the interior trim, with its textured ABS mouldings and velour finishes, departs from the grey carpet of yesteryear. An Audi driver climbing aboard would feel at home straight away. There are thoughtful touches everywhere. EVM uses its panoramic glazing in Cityline, bringing in plenty of daylight. The window sills are wide and clad in leather-textured ABS, perfect to rest an arm upon, and with double glazing, no condensation to stain the user’s suit jacket. The flooring is a glittering non-slip wood effect. EVM has installed luggage racks, engineered specifically for this vehicle. 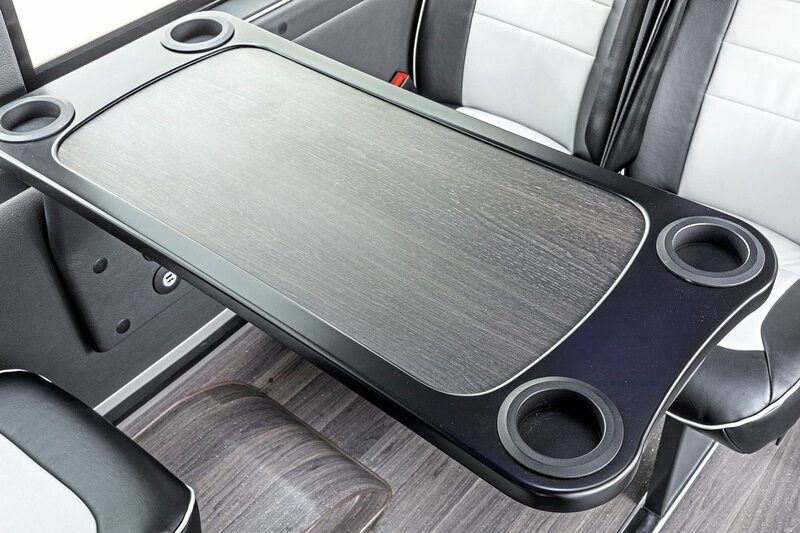 And as a bonus, six of the 15 passengers get a high-quality table. The seated capacity, of 15 including those on tip-ups, says a lot about the volume of passengers DRT is aimed at, and the wheelchair space not only tipping a hat to regulation but providing a truly accessible bus for everyone, including those with lesser mobility issues. There’s a manual ramp, of course. Though it’s filled with a plastic blanking strip, the floor of the Cityline is tracked. At the driver’s end of the wheelchair bay, two covers reveal tracking into which wheelchair passenger restraints can be fitted. The rest of the tracking gives the Click vehicles a clear route to a second life, perhaps for a CTO. EVM is a past master at making the vehicle fit the client, and along the way, gleans useful ideas which it sometimes adopts for other clients. For example, in the lowfloor area, a grab rail runs the length of the wheelchair bay. 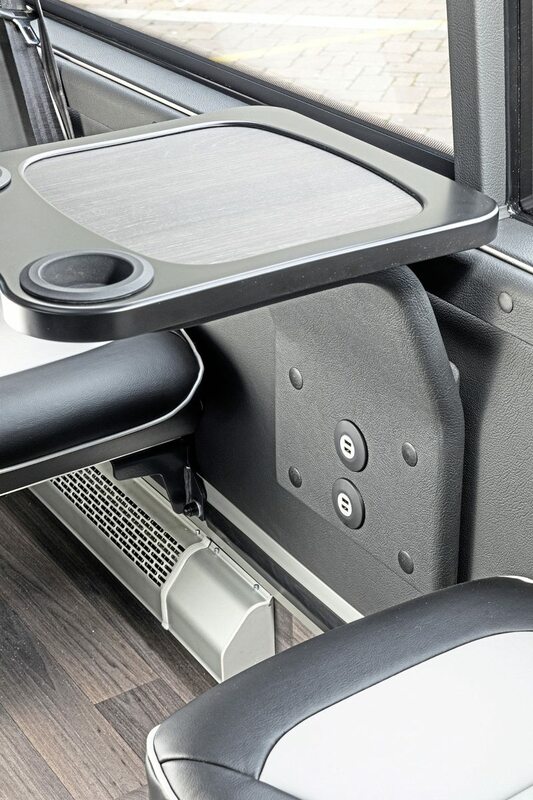 This partly comes about because one of EVM’s community bus clients pointed out that a full-length grab rail is useful for elderly folk with trolley bags, who use the rail, with a bungee cord, to anchor their trolley bags in place. 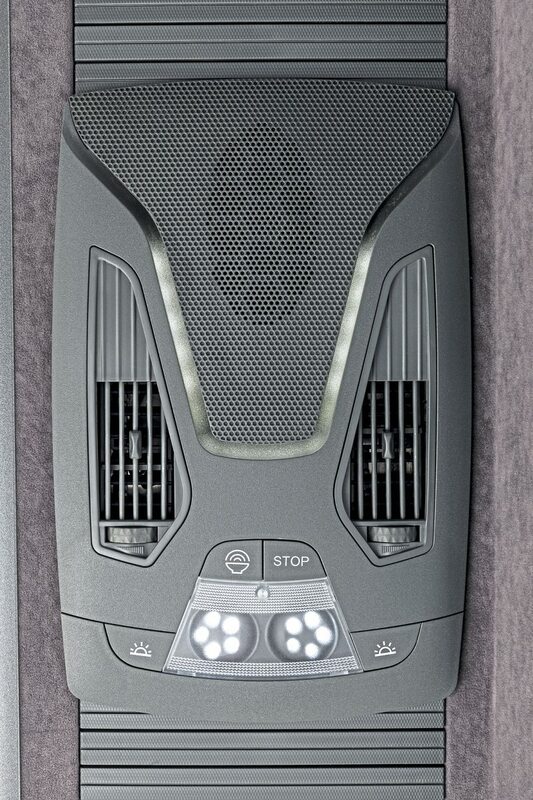 That’s not its purpose on the Click vehicle, but as it’s unobtrusive and useful anyway, it has become part of the standard specification. 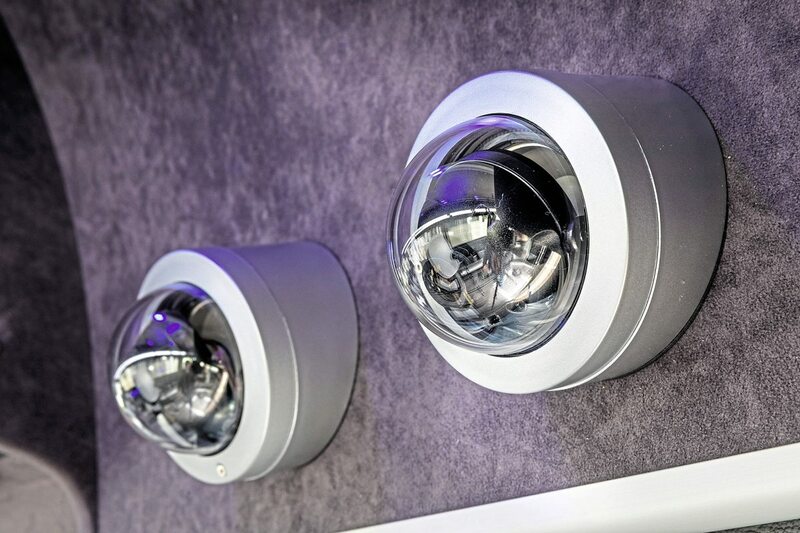 The Click Citylines have Big Brother levels of CCTV installed by 21st Century, and the wifi system by Icomera has train-quality access to 4G; lesser systems can provide narrower bandwidth and patchy connections. Peter Flynn, EVM’s Sales and Marketing Director is unequivocal about the starring role Masats’ double sliding door plays in the Cityline’s abundant charms. The vehicle started out with a single Ventura plug door but it quickly became apparent that door outswing was something to be avoided. 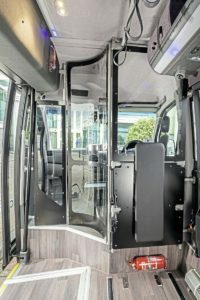 The Masats electrical double door sits in runners, so extends 10cm for the door to clear the bodyshell, then slides, extremely reliably, without the chance of it clouting passengers at the stop. It’s such a minimal outswing that the Cityline can be brought extremely close to the highest kerb without the chance of it grounding. It is an exceptional, rattle-free fit. Even at 62mph, there was no road noise intrusion at all; it’s possible to see daylight under some bus doors. That’s not to say there is complete silence in the saloon. There’s a level of transmission noise on acceleration and overrun which is common to all Sprinters, and probably reflects the over-engineered nature of the diff. It wasn’t intrusive; quite possibly made more apparent by the absence of any other noise, and would be overwhelmed by chatter or the local radio station played to passengers at a modest volume. It’s the performance of Sprinters which sets them apart. Not only is acceleration smooth and brisk, but they exhibit car levels of driveability, especially with the suite of electronic handling controls built into the product by Mercedes-Benz. On top of this, their reputation for reliability goes before them. In developing the Click specification, EVM had to create an assault screen for the driver to meet union demands; nobody would argue that drivers should be at risk of the disgusting assaults on them which seem prevalent at the moment. Typically, instead of approaching the local acrylic company for formed plastic items, EVM went straight for glass screens, bordered with black: “The kind of thing passengers might see in an office,” said Peter. This also lessens the chance of the assault screen being scratched and yellowing with age, as is so often the case. Peter Flynn says EVM’s focus on the operator has led to its many successes for the Cityline, following experience gained building minicoaches. It’s all about service, he says. The key to attracting major orders, says Peter, is focus on the TCO of the vehicle: “It’s a total package. We give quotes for vehicles within the hour, take orders with delivery dates, and deliver vehicles when we say we will. This last ArrivaClick is ahead of the delivery date we promised. He says the future for the product will, in time, hopefully include a hybrid but other developments will be at the behest of the operator and, ultimately, the customer. As for the driver, there will be few moans about the job becoming repetitive. The driver has a neat table to his or her left for a tablet computer – the technology which drives DRT services. For the whole point of modern DRT is really that it all of its business is conducted on-line, with software which schedules and re-routes services to create economical travel, and collects the fares at the same time. It’s a radical departure from doing some research, sticking a wet finger in the air and running empty buses in the hope people will hop aboard, and potentially a step-change in bus services which will allow operators to launch more appropriate fixed routes. So how does it work? ArrivaClick is fairly typical of the new DRT approach. 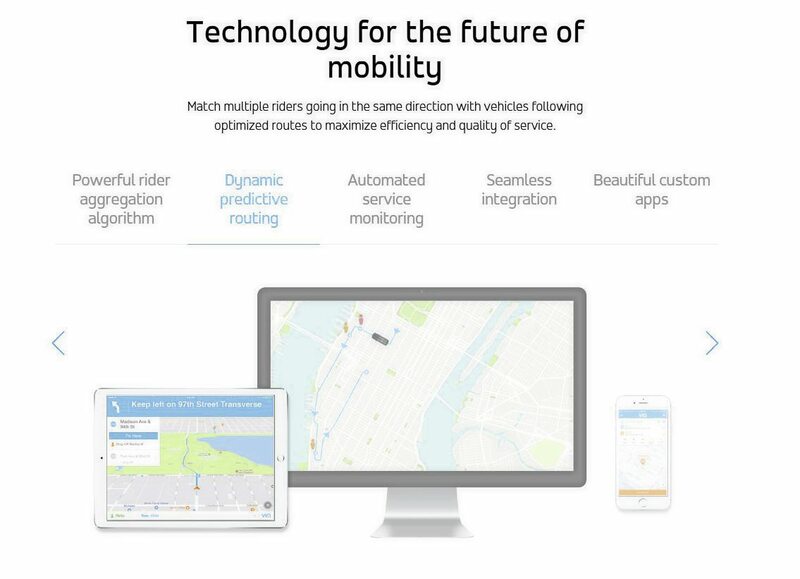 With this service – adapted from an app by American software company Via – potential users create the journeys, instead of operators. The new customer downloads the ArrivaClick app to a smartphone or tablet computer, personalises it and uploads details of a credit or debit card, then adds some credit and creates, on a map, the journey they want to make, giving it a time slot. The origin and destination can be created by typing an address or setting a location directly on the map. ArrivaClick directs the user to the nearest ‘virtual bus stop’ – locations which suit the DRT service – but these are never more than 200 metres from the user’s starting point. Unlike fixed-route services, the complexity of passengers’ journeys is no barrier. Of course, this passenger is not alone. Hundreds of passengers may be doing something similar on the same day, and the blizzard of destinations would be impossible to unravel and plan for without computing power. Making tens of thousands of calculations a second, the software – which resides in The Cloud, not on the operator’s computer – aggregates all the journeys and plans routes, using available vehicles which can pick everyone up in their timeframe. The driver gets his or her route plan through a tablet computer, without the operator’s intervention. The screen gives the driver directions and where to pick up throughout the journey. The customer gets text confirmation, a warning of the service’s imminent arrival and confirmation it has arrived. Payment is deducted when the passenger exits the vehicle. – Almost nine in ten (8.9/10) customers would recommend using the service to a friend. This journey-planning by algorithm isn’t new; parcel companies and PTS have been using similar systems for some time, the driver’s journey updated in real time to accommodate additional pick-ups. 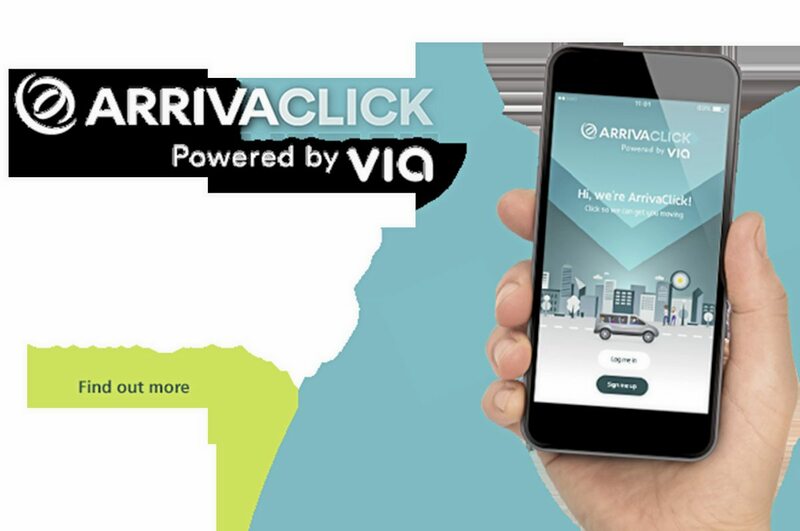 Checking the ArrivaClick Facebook presence, you’ll see that at peak times, it can be a victim of its own success, with some reviewers saying the app has refused bookings because there are no seats. As vehicle numbers have increased, this has decreased. 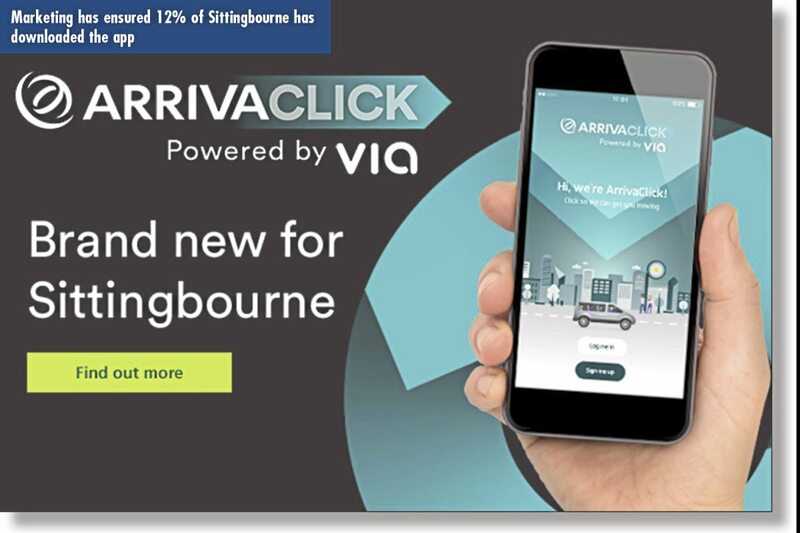 Negatives are, though, outweighed by passengers in both Sittingbourne and Liverpool – the two areas where ArrivaClick is currently operating – heaping praise upon the service and, in particular, the drivers. Potentially, passenger aggregation apps such as Via could change the face of bus services for good. As passenger numbers and data builds, the operator begins to get a picture of the real travel patterns of people and, in time, can replace low-volume services like the EVM Citylines with fixed-route services. Indeed, ArrivaClick does suggest both possibilities to users. Computing experts Bus and Coach Buyer has spoken to say that apps which continuously collect details of the location of smartphone users – Google does this already – could potentially take this idea a step further, identifying travel patterns based not just on booked journeys, but all travel, the time and day of the week it was made, then creating routes for which it already knows it has potential customers. As with all data-driven software, and bus services, there’s a critical mass at which it becomes truly and profitably viable. Arriva has doubtless required a steel nerve to give the service a long trial, but has told journalists that it is already making ends meet. The reality is that such services have the potential to be research tools as well as transport services, with passengers paying operators while providing the data which both stakeholders require to provide a useful service. It’s a virtuous circle. As congestion builds on the UK’s road system, there has to come a point at which city planners and, indeed, central government, realises that the answer is not to grow the road network but to use it more efficiently. Cities do not thrive on vehicles but on people, and until we measure traffic in terms of the people, we are on a treadmill which is unending. 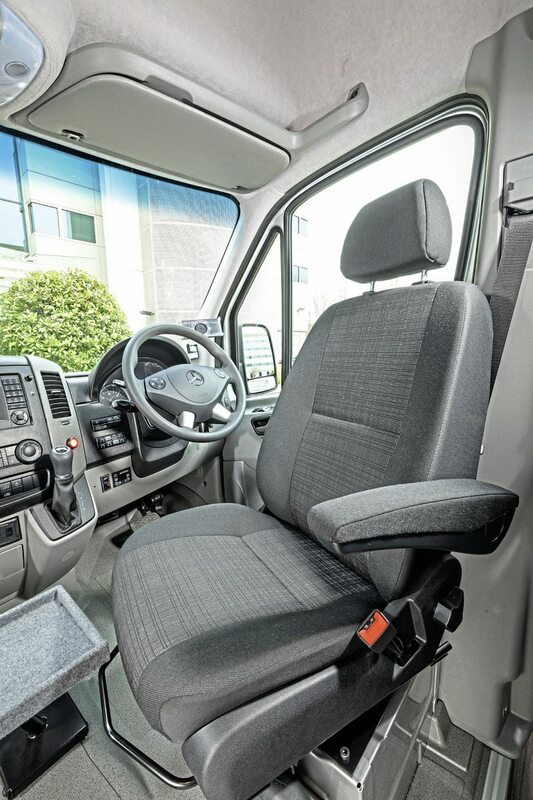 Car drivers will not swap their cosy seats without a convenient service to replace their car; a service which not only presents the levels of comfort and familiarity which EVM’s Cityline does, but delivers them where they want to go, when they want to get there, on time. It is due to cars that people’s journeys have become diverse and individual; the days of 5,000 people starting work in the same place at 8.30am have gone. DRT can potentially provide such a service. Anyone who is not already using traffic-armed GPS systems – Google maps’ impressive Android Auto for example – is living in the past. The Editor at Bus and Coach Buyer has lost count of the number of times Google has taken him around sudden traffic jams instead of into them. Google knows the average speeds along the UK’s roads at any time of the day or day of the week and, when he arrives, it’s usually within five minutes of the prediction. Public transport – and we must include taxis and DRT in that definition – must begin using these resources as soon as possible so that it can demonstrate its adaptability, improve its efficiency and present to government an alternative that works, not just in city centres where large-scale travel patterns may be predictable, but everywhere.